Our knowledge of color inheritance in Shelties has increased dramatically with the advent of DNA studies. Some of the color genes described by Clarence Little (The Inheritance of Coat Color In Dogs) have been confirmed, others have been disproven, changed or added. There are three major genes responsible for color inheritance in the Sheltie. Genes are simply sequences of DNA on chromosomes which lead to certain characteristics. Variations within a single gene are called alleles. Genes are located on chromosomes, which come in pairs, one gene to a chromosome, so each dog has a pair of alleles for each gene. DNA Studies: The gene responsible for the A or Agouti series colors has been identified on canine chromosome 24. Each of the four color variants that have been identified (three are present in the Shetland Sheepdog) is associated with a mutation in the DNA which lead to changes in the Agouti protein. The wild type, called wolf sable, is not found in the Sheltie. The gene for dominant black, formerly designated A, has not been found in the agouti series, and is now considered to be the dominant allele at the K series locus. M Locus: The M Locus produces the merle pattern. In the Sheltie, this is the locus responsible for irregularly diluting patches of black hair to blue-grey. The M gene technically has incomplete dominance, because the heterozygote (Mm) can be visually distinguished from the homozygote (MM). A double, or homozygous, merle is MM. Such a dog is predominantly white, and usually has defective hearing or vision. Blue merles, with or without tan points, and sable merles are Mm. Non-merle Shelties are mm. There is some overlap in the amount of white between Mm and MM dogs. In both Australian Shepherds and harlequin Great Danes, a few individuals, with enough color that they would be expected to be heterozygous Mm blue merles, have turned out to be genetically MM double merles. The Cryptic Blue: The cryptic blue is a dog who at first glance appears to be a tricolor or bi-color black. Close inspection usually, but not always, shows small amounts of merling. The dog is an Mm dog, who produces blue merle offspring like any other blue merle Mm dog. I asked an Australian Shepherd breeder whether cryptic blues occur in that breed. The answer was, "Yes, and sometimes the blue comes off with the tail dock." DNA Studies: The gene responsible for the M or Merle pattern has been identified on canine chromosome 10, and is an SILV gene, an important color gene in many other mammals. It is not a point mutation, but is an insertion of roughly 253 base pairs into the DNA of the SILV gene. This inserted sequence of DNA is apparently fairly fragile and can be damaged (shortened) during cellular reproduction. Dogs which carry the shortened form of the insertion are NOT merles and are genetically unable to produce merle offspring. This, as well as cryptic merles, are likely explanations for the occasional tricolor offspring of a double merle. A Locus: The A or agouti locus produces the so-called Agouti Series colors. In the Sheltie, this is the locus responsible for the sable, black and tan, and recessive black colors. Although three variants of the gene are found in Shelties, each individual Sheltie can carry only two of them. White is superimposed on all of these colors, and is inherited independently of them. Within the A series, sable is dominant to black and tan, and to black. Black and tan is dominant to black. The allele for sable has been designated ay, the allele for black and tan is at, and the allele for recessive black is a. A Sheltie who carries at least one ay allele will be sable. If both alleles are ay, the dog is pure for sable and can produce only sable offspring. If one allele is at or a, the dog can produce tricolor or black and white offspring when bred to a dog who also has at least one at or a allele. Such a sable is tri-factored or bi-factored. A Sheltie who carries two at alleles or one at and one a allele will be a tricolor. A Sheltie who has two a alleles is a bicolor black. S Locus: Researchers have only started to identify the genes responsible for white markings on dogs. The S locus is one which has been studied at the DNA level. It has two alleles, unlike the S series hypothesized by Clarence Little.. In Shelties, the dominant S is a dog with typical Irish-white markings around the collar, and on the face, chest, legs and underbelly. The heterozygous, or white-factored, dog typically has an increased amount of white, and often has white up the front of the stifles. The homozygous recessive, ss, is a color-headed white in Shelties. At the present time, no DNA findings have explained the presence and extent of the Irish-white markings that appear in all contemporary Shelties. It appears that several different genes act together to produce varying degrees of white markings in dogs, as the S series genotypes do not predict the extent of white markngs in all families of dogs. There is no current explanation for the varying white markings on the faces of Shelties. The S gene may not be the only gene that results in predominantly white Shelties. Small white body spots may sometimes be an accident of development rather than a reflection of the dog's genetic make-up. It is unlikely that the two Shelties pictured below have exactly the same white color alleles, although both fall within the range of Irish white markings. NOTE: This chart gives the likelihood of color-headed white Shelties, as determined only by the S locus gene. The Sheltie with a small white body spot may not be genetically a white or white -factored. The continuous gradation of color, from a nearly solid colored Sheltie to a Sheltie with color only on the head, make it likely that several genes act together to determine the amount of white in the coat. DNA Studies: One gene for producing white markings has been identified on canine chromosome 20. This is considered to be the S locus. The gene is the MITF gene, also known to produce white markings in other animals. It has has been shown to produce predominantly white markings in numerous breeds including color-headed white Shelties. B Locus: The dark pigment of the dog is termed eumelanin. The alleles at the B Locus determine whether the eumelanin is black or brown. There are many confusing names for the brown color. Chocolate Labradors, liver German Shorthairs, brown Newfoundlands, and red Australian Shepherds are all homozygous for the recessive brown allele. The gene affects the color of the skin as well as that of the coat, so that a homozygous recessive dog has a brown nose and eye rims as well as a brown coat. The Sheltie is uniformly black, which is the dominant condition. The recessive brown is only rarely seen in Shelties. See the photo on Sue Bowling's website. DNA Studies: The B locus is the TRYP1 gene on canine chromosome 11. TRYP1 is short for Tyrosinase Related Protein 1, which is a determinant of coat color in many other species. The dominant B allele results in the production of black rather than brown eumelanin. There are actually three different recessive alleles termed bc, bd, and bs, each acting a bit differently, but any combination of two of them will result in the production of brown eumelanin rather than black. C Locus: The C locus was described by Little as causing progressive dilution of both black/brown pigment and red/yellow/tan pigment to the point where the most recessive allele caused complete albinism. This description was based on genes that exist in mice, and their exact location and function in the dog is not clear. That there are several genes that dilute both kinds of pigment is clear. Whether they correspond to Little's C locus is not clear at all. In the Sheltie, the dominant gene for full pigmentation appears to be the only one routinely found. D Locus: In the Sheltie, the recessive allele at the D locus causes the dilution of black pigment to grey, which is also called blue dilute. This recessive gray is present at birth and is seen as a dog with dark gray nose and eye rims, and the black portions of the coat diluted to dark blue-gray. It has no effect on the tan pigment of a sable coat, although it can result in a grey-nosed sable. This is the color that is called the Maltese blue dilution. It produces a tricolor who is grey, tan and white, and a bi-color who is grey and white. The effect is very pretty, but not currently allowed by the breed standard. A Sheltie who has at least one dominant D allele will have black pigment. 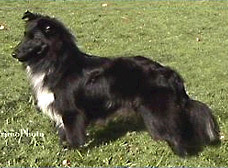 In a Sheltie who has two copies of the recessive d allele, the black is changed to a dark blue grey color. Unlike the merle gene, the dd dilution does not produce a mottled coat. There is a uniform shade of gray in the parts of the coat that would otherwise be black. Photos of a blue dilute tricolor can be seen on Sue Bowling's website. Some Shelties have a dilute coat color, but retain black noses and eye rims. It is uncertain whether this is due to the same mutation. DNA Studies: The blue dilution in many breeds is associated with a mutation of the MLPH gene on canine chromosome 25. The DNA test that has recently become available to identify carriers of the blue dilution will be reliable only for the breeds for which it was developed. The gene has not yet been examined in the Sheltie. DNA Studies: The E locus gene has been identified as the MC1R gene on canine chromosome 5. The mask is due to a single amino acid substitution, the grizzle color is due to a differeent amino acid substitution, and recessive yellow/red is due to a premature stop codon. This last is a mutation that stops amino acids from being added to a protein, thus resulting in a non-functional protein. The mutation for the brindle pattern has NOT been found at this location, and has been re-assigned to the K locus. E Locus: The E locus alleles are extremely important in many gun dog breeds. Four alleles are present. The most dominant allele is Em, which results in a black muzzle, and permits expression of K and A alleles anywhere else on the body.. Recessive to Em is the Eg allele, which produces grizzle Afghans and domino Salukis. Recessive to Eg is E, the common allele in Shelties, which allows black pigment to form anywhere in the hair coat. The recessive e allele, which is not found in Shelties, prevents any black/brown pigment from forming in any part of the coat, so that the dog is uniformly red or yellow. Black pigment is still present in the skin. The ee genotype is found in yellow Labrador Retrievers. G Locus: This is the greying gene which results in a dog who is born black, but who whose black gradually is replaced by a uniform grey color as the dog matures. The breed most characteristically associated with this gene is the Kerry Blue Terrier. Sheltie are uniformly gg, and their coat remains retains full depth of color as the dog matures. The dominant G allele, not found in Shelties, results in a coat where the black (or liver brown) becomes grey as the dog matures. K Locus: The dominant black color belongs at the recently described K Locus. The dominant allele results in black dog. This is the common black of the Border Collie. Recessive to black is brindle, and recessive to brindle is non-brindle tan. Brindle is a pattern of vertical black stripes on a tan background, so it can only show on areas of the dog that would otherwise be sable tan. The K locus interacts with the alleles of the A Locus. A dog carrying one or two KB alleles will be uniformly black, and unable to show the A series sable and tricolor patterns. A dog without the KB allele, carrying one or two copies of the kbr allele will show the sable and tricolor patterns of the A series, but the tan areas will be brindled. Thus, a sable will appear brindle, and a tricolor will be black, brindle and white. A recessive black (aa) will no show any evidence of brindling regardless of the K Locus genotype, because he has no tan on which the brindle can operate. The Sheltie is almost universally kyky in genotype, so that the A series tan has no brindling. 1. It can be ee at the E Locus, and therefore have only yellow/red pigment in its coat. In technical terms, ee is epistatic to genes of the K Locus and A Locus. The e allele is not known to occur in Shelties. 2. The dog can be KBkbr, carrying brindle as a hidden recessive. The KB allele is not known to occur in Shelties. 3. The dog can be aa at the A Locus (eg. a black and white Sheltie), and therefore have no tan pigment for the brindle allele to affect. Since Shelties do not appear to carry dominant black, KB, since they do not carry the recessive e allele, and since the recessive black has only recently gained wide acceptance as a color, a hidden brindle is extremely unlikely. 1. The puppy was not a purebred Sheltie. 3. The puppy was a Sheltie, and the brindle color was the result of a mutation. 4. The puppy was a Sheltie, and the brindle allele had been carried through successive generations of recessive black and white (or blue merle and white) Shelties, aa in genotype, since the origins of the breed without ever being expressed. This explanation is less than satisfactory in view of the stated colors of the parents and the relatively low frequency of the a allele in the breed. T Locus: The gene or genes that cause ticking and roaning have not been identified. There may well be more than one gene onvolved. Dogs who carry the recessive t allele are born without ticking and remain so throughout their lives. A dog who carries at least one copy of the dominant T allele will develop various amounts of ticking or roaning in the white parts of his coat. If there is only one main gene causing ticking or roaning, there are probably several genes that modify the amount and distribution of the color. Most Sheltie are tt, and the white parts of their coat remain white throughout life. A few carry the T allele and develop colored ticks in the white hair, which is usually most obvious an the feet, legs and face. It is unknown whether the amount of ticking is influenced by whether the dog carries one of two T alleles. DNA Studies: The K locus gene has been mapped to canine chromosome 16. The gene is a beta-defensin gene, which plays an important role in immunity in several species. It has never before been shown to affect pigmentation. The ky allele appears to be the ancestral allele in this series. The KB allele is associated with a mutation that results in a missing amino acid in the resulting protein. However, it appears the deletion is not exclusively associated with the KB allele, as it is present in some brindle dogs. The kbr mutation has not been specifically located, but brindle color segregates as an intermediate allele in the K series. H Locus: This is the locus responsible for the harlequin color in Great Danes. The harlequin color can be seen only in a dog who is also a merle, and dilutes the gray portions of the coat to white. Great Danes of other colors, most commonly black, can carry a hidden harlequin allele. 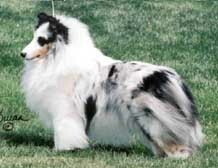 An occasional blue merle Sheltie has its gray diluted almost to white, but whether this is a true harlequin is unknown. The mutation is unlikely to be the same as what occurs in the Great Dane. All Great Danes with harlequin color are heterozygous Hh. The homozygous HH genotype is lethal to the embryo, and double harlequins are not born. Shelties are virtually all hh non-harlequin. DNA Studies: The harlequin gene has been identified as the PSMB7 gene on chromosome 9. The PSMB7 gene codes for part of a proteasome protein. The mutation is a single substitution that leads to critical change in the protein. The proteasome is not directly involved with pigment, but with normal protein breakdown in the cells of the body.